Today just before weekend, which by the way is going to be very cold here in Europe, let me tell you couple of things about our testing facilities. We do a lot of real life tests, however it is time consuming and not that accurate since local conditions might vary from place to place. So, the goal with lab tests, is to simulate conditions in a reproducible way and to come as close to real life situations as possible. It is not that we are not using real life tests, but for us it is more supplement to our lab test. We have several devices which can simulate real life conditions by rubbing, sanding, exposure to UV etc. We are using test conditions and exposure times for these processes according to international standards. If necessary, we also adapt standard test conditions to our own needs. New properties of materials developed by Nanogate Technology® are in some cases so new that we need to find totally new ways for testing these materials. So there is a lot of creativity involved in this work in order to get useful results. Let me give you an example, there are a lot of different meanings among consumers when it comes to hydrophobic surfaces. There are different products available today offering typical hydrophobic properties with strong “pearl off” effect. 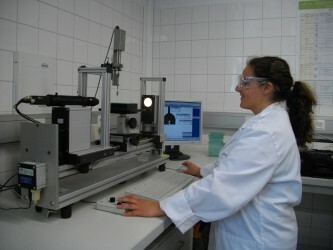 In order to test these surfaces we were forced to develop our own testing procedure. It this article you can read more about it. By developing our testing procedures we are today able to compare all available hydrophobic materials for the same substrate and make graphs which exactly tell us about different performance between the products. By doing this we are actually creating new standard which can be used across industry. If you have any specific questions you are more than welcome to drop us a mail and we will try to answer at our best. Have a nice weekend to you all and see you soon.